I see that John Iley, Ferrari's chief aerodynamicist, has been "let go" by the team and many sites are interpreting this as a result of the poor performance of the F60 this season. Yet it seems a bit extreme to blame Iley for the failure of this year's design to dominate the field, especially as he has been just as much responsible for the very competitive Ferraris of 2005 onwards. So great is the need of the team to win, however, that something has to be done and, as in the past, that tends to mean heads rolling and personnel changes. In point of fact, the F60 was disadvantaged from the start by having no double diffuser and the design department has shown remarkable adaptability in fitting one as soon as possible, thereafter improving the car with further tweaks. A podium finish in Germany was evidence that development is working and it is not beyond possibility that Ferrari might still win a race this year. It seems an unfortunate moment to let Iley's contract lapse, therefore. I cannot escape the conclusion that this is just the latest step in di Montezemolo's "Italianization" of Ferrari. From being an international team composed of the best engineering, design and management minds in Europe, Ferrari is fast becoming a truly Italian national team. That may be in keeping with the needs of its support and fanbase but I doubt that it can do much for its competitiveness in F1. Say what you want about Jean Todt (and I shudder at the thought of him in Mosley's position) but he was never one to take nationality into account when building and maintaining the most efficient team in the sport. Expectations of glory die hard after a period of dominance and there are still those who see the problems of the moment as a mere blip in the fortunes of the team. Yet the signs have been there for a couple of years now in embarrassing pitlane fumbles, decreasing reliability and a fading from the front row of the grid. To me, the surprise has been that the process has taken so long, perhaps evidence of how effective were the working practices introduced by Todt and Brawn. But such things decay and die as new team members are introduced and the last of the old guard clear out their desks. I think Ferrari fans are going to have to show their loyalty over the next few years as their team drifts away from success and becomes the team we knew back in the seventies and eighties, always to be taken into account but ever flattering to deceive. It may even be that, with Big Ron departed from the scene, McLaren too will not be the force we have been accustomed to. This year of Brawn and Red Bull success may not be a short-lived departure from the status quo but may continue and become the norm of the future. Such changes happen in F1 from time to time, as those who remember the great days of Tyrrell, Lotus and Williams will attest. Nothing lasts forever. Which is true but ignores the fact that Ferrari is always with us. Other teams come and go but the red one goes on and on, regardless of how fortune smiles on it. Like Silverstone, it was there from the beginning and still it remains. Oops, but Silverstone's days are numbered, aren't they...? Your comment about the "Italiazation" of the Ferrari team is most interesting. One one hand, it reminds me of the old days when you could always count on the Ferrari pits and paddock to be a wild and crazy place with people running around like chickens with their heads cut off screaming and flailing about...which I always thought was kind of fun and somehow weirdly appropriate for the team. On the other, as you so rightly said, it moves the team away from the clear-eyed ultra-professional perception of the team during the Schumacher/Brawn/Todt/etc championship years. As an old timer, if I had to choose I think I'd prefer the super emotional Italian team...but that's just because it reminds me so much of how interesting and fun F1 used to be. Am I the only one to notice some prejudice blinks about latins in the F1 world? This sounded like all that stuff that says that only the super pro brits and germans are able to compete when we talk about F1. It's funny how many times we heard those prejudices when the old and good Ron Dennis made all in his hands to avoid a latin pilot in McLaren, with the only exception of Senna, in a time when Mr Piquet had shown his credentials on good british teams. Even Mr Frank Williams signed that fast and professional driver, although it was required to dislike the british lion.... After all, two of the all time greatest drivers, Mr Fangio and Mr Senna, were latins. And when we talk about engineering and team management, two latins comes to my mind on both golden eras of McLaren and Benetton, Jo Ramirez and Joan Viladelprat. It's an historical fact that Ferrari was like a crazy ranch before the Todts, Brawns and Schus. And we all believe that those guys brought to Ferrari a different way to do things, maybe a modern concept that wasn't in Ferrari at the moment. 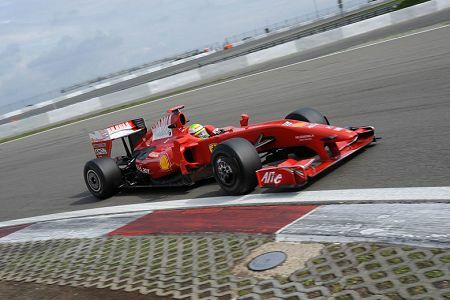 How much of it is related with the ancient regime of the team, commanded by the old Enzo Ferrari is yet to be discussed. But I think that today we are talking of complete different matters. Ferrari is a leading edge Factory, an organization capable of the most advanced engineering. They have made the biggest step trying to close the gap with the double diffusered cars, a much better work than the BMWs, McLarens, Renaults, etc etc, a job done without the Stepneys, Brawns and co. And those faults in the pitstops last year are to be seen this season. When new people comes into scene, you need some time to adjust the pieces. But I'm sure Ferrari is teached not to shoot its foot, don't you? After all, we don't know where these new people comes from, maybe they're brits or germans after all. Indeed, but Todt was fiercely loyal to Ferrari till they ‘appeared’ to be finished with his services. An interesting condition looms on the horizon:- di Montezemolo president of both FOTA and Ferrari, with Todt newly elected president of the FIA. Could it be that the promised F1 renaissance will merely become a strengthening of the existing Order? Perhaps there just make one designer do two designers work, isn`t Pedro De la Rosa latin?. If you want the very best there is no room for petty prejudices. I've seen this mentality turn the most winning hockey team into also rans. I remember watching the Ferrari mechanics working all night changing motors in the Watkin's Glen pits in the days that fans could come and go as they liked and, believe me this was high entertainment for a young motor head. Tools everywhere and then a mechanic with an atomizer full of gas, priming the motor, and then the roar of a flat twelve. Before the great homogenization Ferraris didn't always win but they were THE artists on the grid. Through the Schumacher era, they were not so much artists as robotic thugs, which was awful sad. They may have gained many trophies but it cost them all sorts of mana along the way. Maybe Montezemolo has the right idea. If Ferrari want to regain the respect they once had they must start polishing things. If Ferrari wants to be Italian, well good for them. It would seem as if it's become politically incorrect to stick up for your own. Once everything's homogenized nothing's special. I sure hope the American team supplies a different flavour to F1. F1 needs it. While it would seem on the surface that Ferrari is indeed being re-nationalized by LDM, let's remember that many of the key people now are still not Italian. These include Nik Tombazis (who'll now be absorbing Iley's role, I believe), Chris Dyer (who's taken over Luca Baldiserri's on-track role), and Rob Smedley. There's even rumors (although far-fetched, I think) that Ferrari are intending to lure Geoff Willis to Maranello. Indeed, Ferrari haven't really been a fully Italian team since the 80s, when they hired Dr. Harvey Postlethwaite and John Barnard to design and develop their cars. I think it'll take some time for this new generation of Ferrari men to gel together into a cohesive unit. Once they do, they'll still be right at the sharp end. As someone who knows a thing or three about web development, I know how frustrating it is to find the rootcause of that kind of error. F1 is nomadic in nature. 2005 was not a good year to be at Ferrari as the car was horrible all year...you say this is when he first came to the team. Since then the cars have suffered in certain conditions (rain last year, and all around twitchy this year). Of course blaming one man for an entire corporations failure to create a winning car hardly can rest on one man. As you said clive, heads must be rolling. There are numerous ways to interpret this years car. One could say they are 'blaming' one individual and one could say an individual did not do his job. If Ferrari believed the double diffuser concept was illegal and clearly they did, one would assume their car would lean toward strong mechanical and aero grip, which it clearly did not have. Since Ivey was in charge of the aero development, whom else would one look to in this area?